A Jensen Beach non-profit is working to educate the public that balloon releases are nothing to celebrate for wildlife and the environment. "Every balloon not released is a life saved," said Danielle Vosburgh, co-founder of Balloons Blow. JENSEN BEACH, Fla. — A Jensen Beach non-profit is working to educate the public that balloon releases are nothing to celebrate for wildlife and the environment. "Every balloon not released is a life saved," said Danielle Vosburgh, co-founder of Balloons Blow. 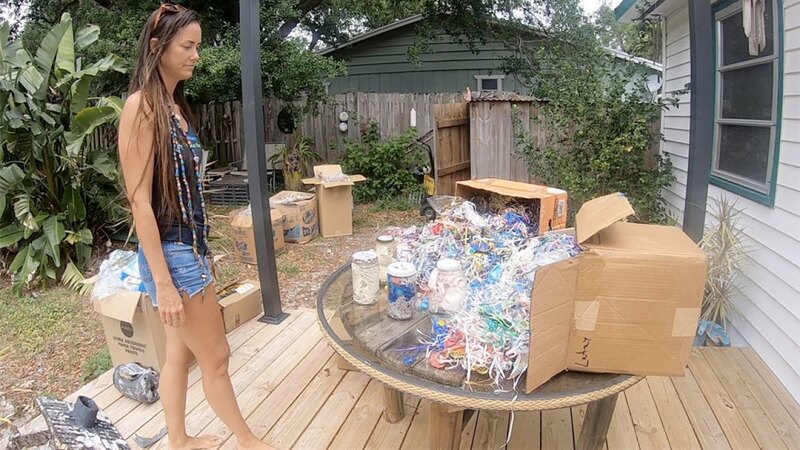 Vosburgh has an extensive collection of balloons, ribbons and other types of plastics in a shed in her backyard in Jensen Beach that she initially found on the beaches on Hutchinson Island over the last eight years. "These animals out there, they don’t realize humans are polluting the planet with all our garbage," she said. "They just think everything is food. They’re just out here munching on this stuff then their belly gets full of garbage." Vosburgh has been cleaning area beaches with her family since she was young, but she eventually started seeing more balloons washing ashore. In 2011, she started Balloons Blow to raise awareness of the environmental dangers of balloons and how helium is a finite resource. Since then, the Balloons Blow Facebook page has garnered more than 67,000 likes. “We were hearing from people around the world that were coming across the same problem," she said. The Balloons Blow community spent seven years asking Clemson University to stop their balloon release tradition at football games. Now, they're working on ending the balloon release at the Indianopolis 500, which is coming up next month. Balloons Blow recently sponsored a billboard in the area of the Indianapolis Motor Speedway that read, "BALLOONS POLLUTE AND KILL. #StopLitteringIMS BalloonsBlow.org." Vosburgh said the billboard got taken down within 24 hours by the advertising company. "We just need more people to speak up and put more pressure on these organizations who are littering the planet we all share, " she said. In Florida, it's illegal to release 10 or more balloons in a 24 hour period and to organize mass balloon releases unless it can be proven to an officer that the balloons are biodegradable. Doing so could earn you a $250 fine.